A weekend with Ubuntu 9.04 and Kubuntu 9.04. First a big thank you to the Ubuntu / Kubuntu communities for providing their time to put together such fine Operating Systems. If you want to learn more about Ubuntu 9.04 you can go here and if you would like more information on Kubuntu 9.04 go here. With the release of Ubuntu 9.04 I figured it was time for me to download the ISO and see what this new version of Ubuntu brings to the table. While I was at it I also decided to get the Kubuntu 9.04 ISO and if I had time I would check that out as well. I have to say before I get to far into this I was thinking about not upgrading to version 9.04 of Ubuntu because I had version 8.10 of Ubuntu running just the way I wanted it to. However I decided I should upgrade to version 9.04 just to see if it was all that different. For me one of the biggest problems with any of these Linux installs is a lot of them don’t seem to get the screen resolution right. For anyone who has read any of my Ubuntu articles in the past you already know I’m not a big fan of Live CD’s that load up into low resolutions such as 800 by 600. So then you can imagine the look on my face when I put the Ubuntu 9.04 CD into the drive and booted that up and low and behold I had an 800 by 600 desktop. It’s at this point in time that I’m ready to take the CD out of the drive and snap it in half but instead I decide to see if I can get the Nvidia graphics driver loaded up into the Live CD. When I had this low resolution desktop problem before with an Ubuntu Live CD I could go to the hardware drivers program and pick the Nvidia graphics driver and install that. Then I would just have to reboot the X graphics system and I would be good to go. Well with Ubuntu 9.04 they decided to disable the hot key combination needed to be able to restart the X server. This really really really really pissed me off since now I would have to fire google up and go look for a solution to this problem. After a while of browsing around on google I found an article where they talked about another key combination to reset the X server and this was using the ALT + SysRq + K I was pleasantly surprised to see that this key combination reset the X server and I was back in business with the proper screen resolution. This whole issue with the wrong screen resolution being detected is something I feel has to get fixed ASAP, because if you’re trying to show Linux off to someone and the first impression they get is it’s a hassle to get the most basic things working correctly it gives Linux a black eye and certainly doesn’t come off as user friendly. I think what annoys me even more about this resolution problem is that some Live CD’s can detect the monitor and the graphics card just fine and select the right resolution with no issues at all. If some Live CD distros can do this successfully then why the hell can’t the Ubuntu guys? The Live CD that does detect my screen resolution right is Fedora Core 10. The Video card on the computer that Ubuntu can’t detect the resolution is a Geforce 7950 graphics card. This video card has been out for a number of years so I have no idea why the Ubuntu Live CD is so crappy at setting the resolution up for it. Also it should be noted that when I do get the 800 by 600 resolution on the Ubuntu 9.04 Live CD that’s the highest resolution I can get. If I go to the display settings 800 by 600 is as high as it will go. On a side note I have another machine here I use for windows gaming and for the hell of it I tried the Ubuntu 9.04 Live CD in that machine and in that case it detected that the video card could display up to 1920 by 1200 and that’s what it set the monitor resolution to. The video card in that system is a fairly new Geforce GTX 260. So as you can see it’s hit or miss in terms of if Ubuntu will detect things properly or not. Despite how annoying this resolution problem is at least the Ubuntu team has made it so you can do a full install with an 800 by 600 resolution and be able to see all the buttons you need to click on with the various dialog boxes that you see during the install. As for the time it took to install Ubuntu 9.04 to the hard disk that was about 14 minutes for a full install. Anyone who has installed Windows XP a lot knows it’s about a 40 minute install to install that, so the fact you can get a full Ubuntu 9.04 install in 14 minutes is really impressive. Once I finally got Ubuntu 9.04 installed the first thing that grabbed my attention was the package manager sitting there with things that need to be updated. With Ubuntu 8.10 you had an icon up in the right hand corner of the screen that would tell you if there were any updates for the system. This new system just pops open the package manager and you hit the install update button and you’re done. I’m not sure as of right now which way I like better, I have to see how it works out over the long run. Like previous versions of Ubuntu you still get the same old brown background and not much has changed looks wise. In the screen shot below you can see my Ubuntu 9.04 desktop as it sits now. When I was testing out Kubuntu 9.04 I noticed there was a cool looking wall paper you could download and so I took that and have that as a background now for my Ubuntu install and it looks a hell of a lot better than the stock brown wall paper that came with Ubuntu 9.04. The looks of Ubuntu are always interesting to me, it seems a lot of users don’t like the brown stock theme that comes with Ubuntu but yet the Ubuntu devs don’t seem to care too much and that’s too bad. 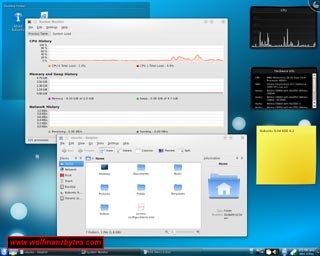 I think the stock Fedora Core 10 desktop looks a lot slicker then the Ubuntu one. I’m amazed with all the people working on Ubuntu that we haven’t seen some more flashiness from the stock desktop theme. After I finally got the system up to date and downloaded some of the apps I normally used is when I run into my next problem and that was with VLC. For those that don’t know VLC is a multiplatform media player that can play movies and the like. VLC in the years I have been using it has never given me any issues at all and that’s on both Windows XP and Ubuntu. However this time when I installed VLC I decided I would play a few mp3’s I had on a spare drive and as soon as I played the song I started to get this digital noise and these small pauses during the first few seconds of audio playback on the mp3’s. I went through a load of my songs and these same problems showed up for nearly all of them. I went through various sound output options in both VLC and in the sound settings for Ubuntu 9.04 and nothing seemed to fix this problem. When I finally did get around to installing Kubuntu 9.04 I noticed the same sound issues I had with Ubuntu 9.04 and VLC were not present in Kubuntu 9.04 and VLC. After giving up on the Ubuntu 9.04 VLC problem I figured I would next try and get my Ubuntu shared folder up that I use to move files between Windows XP and Ubuntu. This is another area where I think Ubuntu could improve a great deal. There is no simple way to setup a shared folder with minimal fuss in Ubuntu 9.04. You have the “Share Folder” option in Nautilus but that does nothing for you when you want to share an Ubuntu folder with a Windows XP machine. When I setup Ubuntu 8.10 I manage to find a online screencast of a guy setting up file sharing between XP and Ubuntu and that was pretty helpful, the problem was he was using a really old version of Ubuntu where he was using tools that were no longer in newer versions of Ubuntu. To make a long story short through this outdated video and a lot of trial and error I finally got the shared folder on Ubuntu 9.04 working the way it should with Windows XP. While trying to get the file sharing working I was thinking to myself why don’t the Ubuntu guys have some links right on the desktop for common issues people run into, such as where they can get some quick answers that pertain to the version of Ubuntu that they are using when trying to setup up things like the file sharing. The Ubuntu community surely has to be big enough that they could have people write some tutorials or do video screencasts that would help people out with common things they might want to do in Ubuntu like sharing a folder with a Windows XP machine. You can sort of do this now if you want to go and search google for hours but often times the information you find pertains to another version of Ubuntu that you’re not using. All said and done when I finally got the screen resolution and the file sharing working and all my programs installed I couldn’t tell any difference at all between this version of Ubuntu and the 8.10 version I had previously installed. People were saying it has this speed increase and that speed increase and that maybe the case but I haven’t noticed any drastic speed increase at all when booting the machine or when moving around the menus on the desktop. My Ubuntu 8.10 wasn’t slow to begin with so in my case I don’t see much if any speed improvement at all. So what’s a man to do after you have your desktop all setup and things running smoothly? After sitting there looking at the desktop for a few minutes I figured screw it lets install Kubuntu 9.04 and see how that is lol. So after all that work messing with Ubuntu 9.04 I was about to wipe the drive out and start over with Kubuntu 9.04. The only reason I wanted to install Kubuntu was to have a look at the KDE 4.2 desktop and so for that reason alone I installed it. I figured if KDE 4.2 was earth shattering I would just use Kubuntu as my main Linux Distro. So just like before I put the Kubuntu 9.04 Live CD in and start the computer up and again I'm greeted with the crappy looking 800 by 600 desktop. Again I do the driver install and the X server reset and I’m at normal resolution again. I let the Live CD install and it takes roughly the same amount of time as the Ubuntu 9.04 Live CD to install. The install goes as planned I reboot and low and behold I get a command prompt WTF escapes my lips and the feeling of I want to snap another CD in half. I rebooted Kubuntu 9.04 numerous times and it simply wouldn’t put me into the graphic desktop. After about 20 minutes of screwing around I was beginning to think that maybe when I installed the Nvidia driver to get the display right it screwed something up during the Live CD install. So instead of sitting here for another hour I said screw it and re installed the Kubuntu 9.04 Live CD. This time I decided not to install the Nvidia driver and instead I would just install with the 800 by 600 resolution. Like the Ubuntu 9.04 CD, installing with a resolution of 800 by 600 didn’t give me any issues in terms of buttons and dialogs being off the screen when installing Kubuntu 9.04. Finally after installing the second time the desktop booted up after I reset the computer and there didn’t seem to be any more issues with the not getting into the desktop from bootup. Below is a screenshot of Kubuntu 9.04. The KDE 4.2 desktop really does look slick, it has a nice black look to it and overall they have done a nice job on the main desktop part of it. What I didn’t like was like Ubuntu 9.04 the default desktop image looked like crap to me and that’s when I went hunting around and found a much better image on kde-look.org. Once I had my nice new wall paper I started to look around and see what KDE 4.2 had to offer and that’s when I run into my next annoyance. While looking around in Kubuntu 9.04 you notice everything has a flat grey non 3d look to all the dialog boxes that the various programs use and although in some programs it looked all right other programs like fire fox didn’t look good at all with this theme. I didn’t think the font selection was very good either and this was really apparent in firefox. The other annoying thing was Kubuntu doesn’t even come with firefox you have to download that from repos and that’s not that big of deal but still why don’t they include one of the best browsers around by default like Ubuntu does? The other problem I had when I installed Firefox was it didn’t know what to do with .deb files you downloaded, you would tell it to open them and you would get a list of programs to select from. For me it was quicker to use the file manger and just go find the .deb file and run it that way. After playing around with Kubuntu for a few hours it just didn’t do it for me. Some parts of it look really good but then there are other things that don’t look that great at all. I think another problem is that Canonicals baby is clearly Ubuntu and that shows when you look at Kubuntu and some of the things missing there. I think KDE 4.2 clearly shows some promise for what it can do but for me there just isn’t enough there as of right now to keep me using Kubuntu. Something else worth pointing out is the KDE 4.2 in Kubuntu is pretty much the stock KDE 4.2 the Kubuntu team never went through and done any real customization to the way KDE 4.2 looks and that’s a shame because I think in the right hands KDE 4.2 could really be an impressive desktop and one of the best looking desktops around. So after messing around with Kubuntu 9.04 and not being overly impressed I figured it was time to get the Ubuntu 9.04 disk back out and go back to that. One thing I didn’t mention above was another thing that drove me up the wall with both Ubuntu 9.04 and Kubuntu 9.04 was the piss poor way both of these distros handle any error messages during the boot process. On both distros I had an error message come up at boot time that I couldn’t pause with the pause key it would just fly by and the graphic login screen would show up. After some digging on google yet again I managed to find a way in a terminal no less to see what’s going on during the boot process with the dmesg command I think it was. Problem was that there was so much text in the dmesg output I wasn’t sure what part of it was flashing on the boot screen. So to know for sure what was going on during boot I needed a way to see that message and that’s when I got the video camera out and recorded the monitor and the boot process. Only then after going through the video frame by frame could I actually see what the message said. It turns out my bios in that computer doesn’t support something and hence the error. This error never showed up in the 8.10 version of Ubuntu so it’s not something I’m concerned about. What really pisses me off about this whole error thing is the people in charge of coding the error messages never considered putting a “press space bar to continue” type of pause when a error is encountered during boot. If this was a server release for an OS or something then you could excuse something like this but when your aiming your distro at average computer users you’re only going to piss them off if they can’t see an error message because someone didn’t have the for sight to think a person would want to see it when the error happens. This is the basic stuff that concerns me the most about Ubuntu it’s nice to have all these speed increases and a different progress bar when loading the desktop but who is actually working on improving things that people really need in the distro? It seems to me like a lot of frivolous things are being worked on but some of the bigger issues are just being ignored all together. In conclusion if Ubuntu 8.10 is slow for you and you think you could use some speed ups then for sure go get Ubuntu 9.04 or Kubuntu 9.04. As I said above for the things I do on Ubuntu I don’t see any real difference between 8.10 and 9.04 but that’s just me. Hopefully my ranting above didn’t get to be too much for people but I’m hoping some people in charge of these projects take some notice of these issues I have mentioned here. The Ubuntu folks should have one rule when testing their betas out and that should be, does the end user have to go to google to complete a certain basic task? if the answer is yes then redo your design until the answer is no. I shouldn’t have to go to google to find instructions on how to change the resolution or how to find out how to see a boot error message. If I ever see a day when I can install and run Ubuntu without needing to go to google all the time I will be a very happy man and I’m sure a lot of other users will be as well.